In this post I’ll continue one of my regular themes: optimism about a faster than expected transition away from fossil fuels and combustion-engine cars. I ran across this recent PV Magazine article, “The age of plenty on steroids”, which is a report from the recent BNEF Future of Energy Summit in New York. 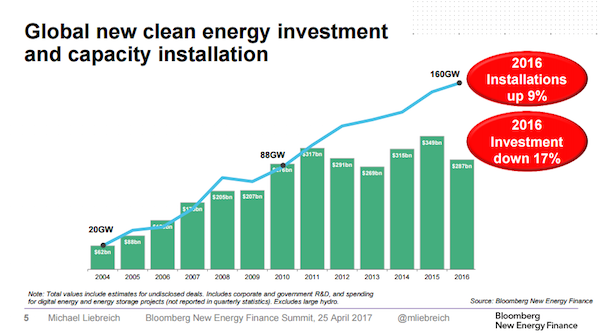 It details why Michael Liebreich, the founder of BNEF (Bloomberg New Energy Finance) thinks there are many reasons to be optimistic about the future of energy, despite climate change, and the emerging political situations in the US and Europe. Granted, he does have a vested business interest in being optimistic about a fast-paced energy transition, but that doesn’t make him wrong. He is certainly not alone in his analysis, and he backs his position with data. Liebreich notes that, even with the Trump administration’s “strange fetish for coal”, the transition to sustainable energy is indeed occurring faster than anyone expected. He points out that 2016 was another year in which Western economies grew but emissions did not. From 2006 to 2016 the United States shifted from just 3% non-hydro renewable energy to 9%. Similarly, China progressed from 6% to 10%, and some EU countries have already reached 25% or more. Liebriech points out the due to the earlier than expected widespread success of wind and solar, some issues are emerging that were not expected until 2025 to 2030. In some places, concerns regarding grid integration of high spot penetrations of renewable energy are no longer theoretical in 2017. In the future even massive amounts of energy storage (batteries) could sometimes be overwhelmed by the variability and volatility of wind in particular. It will mean huge ramp rates and require robust interconnectivity between grids to resolve. The fact that these kinds of issues have arrived much earlier than expected is not a necessarily bad thing. Liebriech is also optimistic about the uptake of electric cars. While just 1 in 500 new cars is electric now, BNEF has predicted that 35-47% of new cars will be electric by 2040. Liebriech maintains that once the sticker prices of electric cars become lower than the equivalent combustion-engine cars, we “will see 40% market shift in any country in the world”. Some are skeptical about one aspect of Bloomberg’s optimism – the increase in GDP becoming decoupled from emissions. The argument goes like this: -Globalisation is masking the carbon emissions for developed economies as production moves to developing economies. This is good news – and it plays to the notion that the ‘Limits to Growth’ crowd are wrong. Growth is not just about resource use in a world where services are an increasing proportion of GDP. Thanks David, No doubt resource use is a factor, especially when the world population has climbed from 7 billion to 7.5 billion in less than 6 years, but not the only one. Increasing efficiency of resource use is certainly going to be an issue in the 21st century – food, water, and energy in particular. The “limits to growth” discussion is an interesting one, too. Obviously the human population cannot expand infinitely on a planet with finite resources. Then the optimistic “abundance” crowd point out that eventually humans will not have to be limited to one planet (planning for asteroid mining is already well underway), and problems like climate change will be resolved with abundant clean energy sooner than people currently realise (citing the exponential growth of technologies such as solar power and nanotechnology). Then we have the technological singularity crowd pointing out that AI will exceed human intelligence as soon as 2030, so we just don’t know what will happen or be possible after that. What? It doesn’t disprove limits to growth at all. That was a carbon based argument. As in, drilling 100 miles down in the Gulf of Mexico would be non-sustainable and non-economic. That you’d need sustainable/non-polluting energy sources to replace those dirty carbon sources. Fracking production costs are increasing today even as more fracking comes on line. Dự án Green Pearl tọa lạc tại số 378 Minh Khai , Hai Bà Trưng, Hà Nội là một vị trí đắc địa thuộc cửa ngõ phía Nam của Thủ đô, nơi tập trung các tuyến giao thông huyết mạch của TP Hà Nội (Đường Minh Khai – Cầu Vĩnh Tuy). Dự án bao gồm nhà ở liền kề, biệt thự và căn hộ cao cấp Green Pearl mở ra không gian sống xanh, trong lành, KHÔNG ồn ào, KHÔNG khói bụi ngay trong lòng đô thị. Chung cư Green Pearl Không chỉ là giải pháp đáp ứng nhu cầu nhà ở chất lượng cao, sứ mệnh của Green Pearl là cùng bạn trải nghiệm cuộc sống” bình yên trọn vẹn “tách biệt với cuộc sống ngột ngạt ồn ào bên ngoài. Không gian yên tĩnh trong lành được khai thác tối đa trên những con đường tản bộ xanh mát sẽ giúp bạn cảm thấy thư thái nhằm tái tạo năng lượng hiệu quả nhất. Dự án 378 Minh Khai hiểu rõ vui chơi là hình thức tốt nhất giúp trẻ phát triển tư duy. Từ đó chúng tôi xây dựng trường học hiện đại, khu vui chơi trẻ em với những trò vui chơi giải trí, trí tuệ giúp trẻ phát triển tư duy sáng tạo và thể chất. Previous post: Is the Solar Singularity Near?